Ordinarily, three-quarters of American commuters drive their cars to and from work with no other occupants beside themselves. If you are one of those, then this is the chart to use. 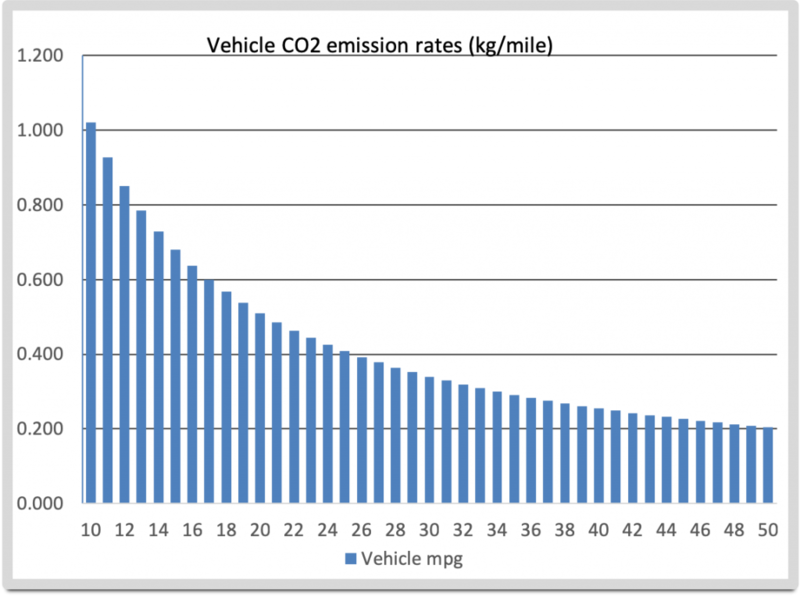 First, select the fuel efficiency of your vehicle, as measured in miles per gallon, along the bottom (X-axis) of the chart. If you’re somewhere in the rest of the world use your vehicle’s efficiency as measured in kilometers per liter, then multiply that number by 2.35 to get miles per gallon. Find that number, or the closest one to it, on the X-axis of the chart. Second, think of the number of miles/kilometers you drive to and from your workplace. In my case it used to be 32 miles round trip. Multiply that by the CO2 emission rate shown on the Y-axis of the chart at your fuel efficiency spot. In my case my Volvo used to get 24 miles per gallon commuting to central Los Angeles so the emission rate was about 0.42 kilograms per mile and my round trip emissions were 32 times that or 13.44 kilograms of CO2 per commute. My current car is a hybrid and gets 40 miles per gallon but I don’t commute any more so my work-related CO2 production is zero. Also, now my annual vehicle miles traveled, all for non-work purposes, is about 40% of what it used to be. And that’s the key: an individual’s telework role may not seem like much but when thousands or millions of us are contributing daily it adds up. Or down, depending on how you look at it. Count the number of days per year that you are not using your car for commuting and you may add a respectable CO2 reduction to your record. So let’s not get out there in the traffic jams. The information above assumes that when you are teleworking neither you nor anyone else in your household is using your vehicle. That is, the entire reduction in CO2 production is a result of your telecommuting. On the other hand we have found that the vehicle usage of entire teleworkers’ families tends to go down over and above the reduction strictly due to telecommuting. So there may be positive multiplier side effects as well. If you have an electric vehicle for your transportation needs you may think that you are not contributing to global warming as a result. However, that depends on the source of your electricity. If your electric power comes entirely from renewable sources, fine. If not, then you should consider the impact of the coal- or gas-burning power plant that provides your electricity; you sill may be contributing more than you think to global warming.